How does the Orwellian world of 1984 exist in the European Union today? We've gotten to the stage that the British writer George Orwell wrote about in a famous book you probably read called 1984. In the book the hero or central character, Winston Smith, specialized in revising history and propaganda. True to the book, the EU is doing this very thing. They are trying to rewrite the history of Europe. Look at the history books that are going to go out as standard issue in all the schools across Europe. The revisionists thought, "We'll just change a few details." And so, they airbrushed a few minor details out of history. Do you know what those "minor details" included? World War I and World War II — they never happened! The young people weren't going to be taught about them. Do you know that students in the EU today don't know about the world wars? Someone I know very well, a MEP who is an Independent, fought a furious battle against this. He got this revisionist history travesty in the press and he got it on TV, and so again the EU propagandists backed down. They take one step back and two steps forward. If they are exposed somehow they shy away. They go back, but when you're not looking, they take that step forward again and they rewrite history. Words have lost their meaning, even on national TV and major newspapers. Society now uses a very small vocabulary. I've noticed this because Pat and I have been newspaper editors for decades. People's vocabularies have shrunk as words vanish from our language. You hear this all the time. When you ask someone what they think about something, they'll say, "That was really neat." What's that supposed to mean? What a stupid phrase! What does it mean? It means nothing. Thought processes have become poorer as people now seem unable to reason or analyze. There were some pupils at a very prestigious school who got the top marks in their county in Britain. I was actually interviewing some of these pupils one day for I used to like to talk to the young people to find out what that they knew. With some teenage girls I asked, "Can we talk about the Second World War?" I instantly knew they didn't know anything about it. I guessed they didn't anyway, but then I discovered I didn't know the depth of their ignorance. I continued, "Tell me about World War II. Who was it fought between?" An amazing thing happened. I wouldn't have ever believed it. One of them piped up after a silence, for they had to think who was in Second World War? She replied, "It was between Poland and England." This is true! I'm not making this up. I replied back, "Poland and Great Britain were involved, but that's not quite the whole story." Gradually I teased a few more things out of them. They didn't have a clue! They hadn't been taught anything. Goodness knows what they were taught in the history classes, but it certainly wasn't history. If you watch television programs that come across from Great Britain, like on the BBC for example, for a lot of the Discovery Network stuff is made in London. you'll find that they talk about metric measure all the time such as kilometers Pounds and ounces have been banned in Great Britain and across Europe. B.C. and A.D. are being dropped from the history books. Inexorably, this was what was said in a major newspaper, "Our democracy and history are being destroyed. The destruction is quite deliberate." This is deliberate, by the way. The destruction of education is quite deliberate. We live in a country called Europe. Romona Prodi said when he was President of the EU that he wants a common EU policy on foreign affairs, defense, law and order, and the power to dictate tax and spending policies. He said, "We are a grand political project, and a super-national democracy." They're not any kind of democracy. They also want to directly tax all the citizens of the country of Europe. When my daughter who lives in Israel wanted to renew her British passport, which is really a European Union passport, she had to go to the French Embassy. That's how far we've mixed and mingled. Brussels they say will be Europe's sole representative to all international bodies. There will even be an integrated European police force. We are sleep walking! Out there the world is sleep walking to tyranny. I was once with a Member of the European Parliament in Brussels in Belgium. Brussels is a rather quaint picturesque old town with this monstrous carbuncle of a European Union right slap in the middle of it. He was taking me around and we were talking and I was looking at the little cobble streets around the European Union. They were concreted over. So, I asked him, "Why have you concreted the cobbles over?" He looked back at me and he replied, "A lot of people don't like the EU. That's hard to believe, but some don't, you know. Protestors used to go here and have the occasional riot, people like French farmers. They used to dig up the cobbles and chuck them at us, so we said, 'We'll stop that.'" The MEP also said, "I'll tell you how else we've stopped protestors. Follow me." So, I walked down the road about 100 yards (100 yards, not a 100 meters; I'm sorry, I'm very anti-metric). I saw these guys who looked like lots of Darth Vader's in visors and shields positioned in a very formidable fort. What was said to me was something along these lines, "If we have any trouble here in the future, we'll crack a few skulls." This is their idea of democracy! You protest against them and you could be in trouble, for what we're seeing is the formation of a European police state. It's the Nazi Germany revived all over again. While the world is racing headlong towards a one-world government, in the meantime we have a job to do. We have to alert people out there. This is a lost and dying world. Bible prophecy really is not depressing. It's a ray of light. It gives hope, because in the end the Lord wins. Believes in Christ come back to rule and reign with Jesus from Jerusalem for a thousand years. The world out there is ignorant, and many are willfully ignorant, but they can be woken up. I don't think there's going to be a great end time revival while the Church is here, but many will come to faith after we're gone. We've got to spread the Word out about Jesus Christ. We need to spread this information on the signs of the times while we can, because a great dark time is coming like a dark blanket over Europe and then the world. We are not going to be able to speak and teach and preach as we do today for much longer. Already in my little church we've only got 50 or 60 people, and yet actually we are one of the liveliest churches in Britain, believe it or not. At least we preach and teach the truth. If you came to see us you would think it was not the kind of place a respectable person would go. Our building looks more like a shed really because we resolved to put all our money into mission. We'd never waste money on a building, because we think the government one day will take the building off us anyway at some stage. What we preach isn't politically incorrect, but it's biblical correct. That's what really matters. That's what people find so offensive, as the Gospel is an offense. If you teach what the world wants to hear, what their itchy ears like to hear, you might be popular. You might write a best seller, but you are not doing the work that God wants you to do. Our job is not to be popular. It's to tell the truth, the whole truth, and the biblical truth. What are some of the methods the European Union is using to remove individual national identities? I flew out from Heathrow Airport in London to the US, but I didn't come out as a British citizen. I came out as a European Union citizen. The passport control in London now has come out under the flags of Europe, and not the Union Jack, which I think is very significant. I got a new passport a couple years ago. On the top of my old passport the British blue was what we were using for decades. It said British Passport. That's what you'd expect, right? When I got my new Euro burgundy passport, right of the top of it says European Community. That shows that I'm number one a citizen of the European Community, but only secondarily a citizen of the United Kingdom of Great Britain and Northern Ireland. The EU actually holds the power, and that's where the power is increasingly focused. Every year on the ninth of May, the citizens across Europe in the continued attempt at trying to create the thought that we are one nation, are supposed to go out and celebrate. My wife Pat and I don't surround the Maypole. We celebrate the building of a super state. Europe Day was instituted some years ago. The builders of the EU are trying to clamp down on symbols of nationalism like the Union Jack. That's why I make a point of wearing it, to annoy them as much as possible. I've actually known a lot of politicians. Pat and I used to out to Downing Street for the Christmas party every year. It's not true that all politicians are either stupid or evil or misguided. But, a lot them are just misinformed. They don't have all the facts at their disposal. One of the very good politicians who is a good friend of mine is Gerald Howarth. He's a MP from the Aldershot area. Until recently he was the Armed Forces Minister in the British government. He used to give me a lot of information. He was very much of a right mind. He wouldn't agree with much of what is going on in the world. I can say that now without destroying his career because he's now not in the government. He's passionately against homosexual marriage. He believes in the nation state and patriotism and he really dislikes the EU. So, obviously, his future was somewhat limited. I just kept quiet about his views until he came out of the government. Gerald actually puts a Union Jack on his license plate. Can you believe that was a criminal offense under European Union law? They instead wanted the stars of Europe on the number plates. We've worked well together over many years and he said to me, "This is terrible." So, I wrote the headline, "It is a Crime to be Patriotic," You'll see that a certain Pat Franklin wrote the story. It escalated. It led to a debate in the House of Commons. The people were woken up because they were unaware of all this. People who don't know the facts are likely to fall victim to all kinds of political correctness and rubbish and be told, "No, this is the truth. No, this was the truth." Back to the story, we told people and people started to get outraged. The EU saw that it was on the losing side of the debate, so it stepped back. That was one battle we won. Gerald finally put the Union Jack back on his number plate. We got some Union Jacks printed and we sell them or give them away wherever I go. When you get your car it comes with a Euro Star on the back, so we encourage British people to paste the Union Jack over the star. You might think, "That's just a little gesture." But, it's quite important. Symbolic gestures are important actually, and people respond to them. There's quite the rising mood against the EU in Great Britain but it's a bit late I'm afraid, because we've had over 50 years of deception. It goes back as far as 1957 when six countries originally got together in Rome to set up what was called the Common Market. If you've been to Europe, been to London or Britain or anywhere, we have street markets. People in Britain love their markets because you can get interesting things quite cheap. The market traders usually have a good spiel and it's entertaining. It's kind of interesting to go and shop there. So, we thought "market" — that's a good idea! People go to France and buy cheap wine and cheese and so on. They come back and say, "That was good." They were sold on the idea that unification was just about trade which will be good for you. When you go abroad, you won't have to change your currency. One currency will be used all across Europe. Common Market sounded so good. Then by stealth, step-by-step when people were not even looking or noticing, watching sport, soap operas, and so on, this common market grew into the superpower called the European Union. It was subsequently revealed and admitted by the man who got us in, Ted Heath who is a traitor to Britain when he was Prime Minister, that the EU was never intended to just be about trade. Today Europe has its own anthem, flag, laws, courts, army, police force and currency. Why hasn't anyone done anything about it? Because we live in a brainwashed sound bite generation. Not many would sit still for an hour-long talk. We don't seem to have the capacity to absorb detailed information anymore. In the fourth and last segment of Alan Franklin's message on the sign of the European Union, Alan compares the Orwellian world of 1984 with how the European Union functions today. Has the Roman Empire revived in the form of the European Union? I bring you greetings not just from Great Britain, but from the European super state that is called the European Union. The revived Roman Empire is on fast forward. Rome is rising! Let's see what this newly revived Roman Empire is doing, because though the Church out there may be aware, the world out there is certainly unaware. We are living on the verge of the climax of world history with the return to earth of the Second Advent of our Lord Jesus Christ as predicted over and over again in Bible prophecy. We hear in the news a lot about Israel which is dear to my heart because I have three granddaughters and one on the way living in northern Israel. They are in Nahariya in the western Galilee with our daughter and son-in-law. So, I know and love Israel. Israel's return as a nation after almost 1,900 years is a major prophetic event that we've been blessed to have seen, most people miss its importance. The other major prophetic event you'll discover when you study prophecy is the rise of the revived Roman Empire, also prophesied around two and a half thousand years ago. In Europe the Roman Empire has returned. At Christ's First Advent, Rome was ruling when our Lord was on the earth. And, when Jesus comes back, again Rome will be ruling. Here's what José Manuel Barroso, President of the European Commission said himself, "Sometimes I like to compare the EU, the European Union, to the organization of an empire. We have a dimension of an empire." Very understated, but that's what they intend to build. For years I've been talking about and claiming that the Revived Roman Empire was being recreated right before our very eyes. Hardly anybody knows about it or has taken any notice. Then one day it was that "eureka moment" for the world and I thought "Great!" because a big circus tent was put up outside the parliament in Brussels, Belgium, which is one of the twin capitals of the European Union. You might think that's pretty appropriate for politicians, because it was for clowns, you see. Anyway, inside the exhibition spoke of the revived Roman Empire. And I thought, "Great, it's not me saying it. They said it." That really was wonderful for me. That was the title of their exhibition. The exhibition went on to make some bold, grand claims. They said, "We will be renamed the Union once we grow to 50 states." There are 28 at the moment and 14 of the states are hovering around in a different federation. Other people are applying to join, so they are not all that far short of coming up to 50. The UN will move the headquarters of the United Nations to Europe. "Hurray!" you say. "Good, we don't want it." But, the move is all about control. It's all about power. That will be what such a move is all about. The EU wants to take over for America, which is what was said at that official exhibition. The exhibition also went on to claim that this will be the European Century. The EU will dominate the world by their enormous legal and moral reach. You might say, "Correction, immoral reach." So, now you know. The supporters of the European Union clearly stated in advance what they're going to do. A lot of would-be tyrants have done this. For example, Hitler when he wrote Mein Kampf many years before the outbreak of the Second World War stated exactly what he was going to do, but nobody took any notice. Maybe they thought he was joking? No, he was deadly serious. So too are these people serious people. They are power players. There is a man who emails me from time to time, a Dr. Anthony Kaflin, who is a Eurosceptic. He doesn't believe in the "Great Project" as they call it. When a country joins the European Union, he sends a welcoming email. He says, "Welcome to the EU, the prison house of nations. Once you're in, there's no escape. They've got you." The EU plans to fast take over the world. They're nothing if not ambitious. Here are some of the countries which are lining up to join. These potential candidate countries range from Iceland to Turkey. Remember, the idea is that if we would all come under one jurisdiction, Europe would effectively be one country. Then, of course, as the Roman Empire expands into North Africa as it did, they'll be taking in African nations as well. It's a globalization process. The organization of African Unity created the African Union which was loosely based on the European Union with a central bank, a central court of justice, and so on. The EU also plans on a Arab Common Market. Later, North and South America also are to come and join in together with the EU. They used to call it the North American Union, but that sounded a little scary, so they changed it to the far innocuous sounding Peace and Prosperity Conference. Hardly anybody believes this exists, by the way. When I started to talk about it, they look at me as if I was mad. At one conference I presented about the North American Union, and my wife Pat helped me go down and give them chapter and verse and pictures and wording and dates and things that were signed so that they could not dispute its existence. Why the disinterest in the rise of the European Union and it's desire to unite the world under its banner? People get all immersed in distractions like sports. They just aren't interested. There is one problem that our two nations have in common. We are sedated with sports and soap operas. These get the energy and the attention of a lot of adults and young people. These unimportant things are what people are talking about in their canteens and offices. This is where their interest lie. Meanwhile, behind their backs, the world is being reshaped in a rather horrible way. Brussels again plans to expand its empire. This is very interesting to see the list of nations. They want to include all of the countries around the Mediterranean, from Morocco to Syria, and Israel, European Russia, Ukraine, Albania, Croatia, Bosnia, Serbia, Georgia, Armenia, Azerbaijan, and countries that a lot of students would be hard sought to find on a map. But, these nations are not too far from the headquarters of the European Union. What the leaders of the EU are doing is dismantling the nation states so that any one of the current 500 million citizens of the EU can legally come, live, and work in Great Britain. Many of these nations have millions upon millions upon millions of people. If they come into England now and go to any city, you will find it absolutely overrun with foreigners. Once in a while you might see a native Brit, but not too many, especially in London. The reason is that these non-Brits have the legal right to be there, and nobody knows how many of them there are. They have the right to vote in our elections. You'll see this very thing happen in America, and it's happening here in America right now. Very similar things are happening. A lot of this move towards removing national lines in Europe are parallel over here with Mexico and Canada. You can easily see the same patent, the same hidden hand, behind this move. 75% of our British laws now originate in the European Parliament where there is virtually no debate. MEPs, Members of the European Parliament, are hardly aware of what they are voting for. Most of them just go there to press a button, claim their expenses, and go away. They vote electronically. They also have only a maximum of about 90 seconds to speak. You couldn't actually come to speak at a conference and in 90 seconds you hardly get started. You've just about taken your drink of water before your time's up. There's no debate really. They don't want debate because the parliament has very few powers anyway. It can't propose laws. It can only modify them. It's a puppet parliament. Members of the Union for the Mediterranean, which is the next step, these countries are being sucked into the EU. Gradually they'll have to follow the same rules, the same trade regulations, the same laws, and they'll have to have a common judicial area. Suddenly it's all merged into one great amorphous country with a central rule that's very bureaucratic and very controlling. 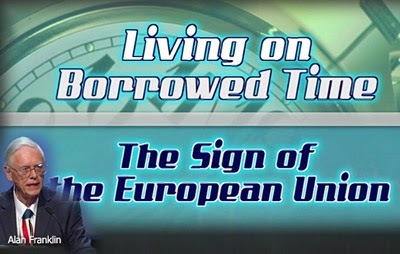 In the second segment of Alan Franklin's message on the sign of the European Union, Alan discusses how the spin works to get people supporting a super state. What is the Convergence Factor, and why is it important to understanding our times? I'm going to be talking about the epidemic of apostasy. I want to tell you a story about a young couple. They went to a movie in the middle of the day, and as they drove off there was somebody watching the house. A robber goes around to the back of the house and he breaks a window. While he's crawling in the back window, he then hears this voice from a parrot saying, "I see you, and Jesus sees you." Well, it didn't bother the man, so he kept on breaking his way in. He's two-thirds of the way in and the parrot says again, "I see you, and Jesus sees you." Finally, the robber is all the way in the house. The guys stands up, and as he brushes all the glass off himself, the parrot says, "I see you, and Jesus sees you. Attack Jesus!" This Doberman Pincher named Jesus roars across the room and mauls the guy. The guy dives out the window, and nobody has ever seen him again. Now that's a different Jesus. I would like to suggest to you that this dog Jesus is not as bad as the Jesus of apostasy. You see, I say that because you can heal from a dog bite. But, if you believe in a counterfeit Jesus who preaches a counterfeit Gospel, then you've got a counterfeit salvation. It simply comes down to that, and that's just as easy to understand as can be. Apostasy is a rich word in the Greek. It carries the idea of a departure or a falling away, a forsaking of the truth, a defection from the truth, a revolt from the truth, and a swerving away from the truth. Listen now, the signs of the times are so critically important. They are prophetic events that point towards the end times. They let us know that we are living in the season of the Lord's return. You might consider the signs to be Intel in advance. Powerful nations have intelligent agencies like the CIA. So too does the Bible provides us with God's Intel in advance, and He does so with signs. The signs of the times are multiple. Categorizations include Israel and the technical signs. There are the national signs like all the nations building up to gang up on Israel, such as the Muslim nations and Russia. We've got religious and moral signs, some of which I'm going to talk about as related to apostasy. Then you've got earth and sky signs and other cosmic phenomenon. I'm not going to touch on all of those signs, but I am going to say that apostasy fits into the larger picture of the signs of our times. You see, it would be significant if just one of these signs was coming to pass. It'd more significant still if two of these signs were coming to pass. But, the fact is, we've got multiple prophetic signs that are converging in our day. It's what I call the "convergence factor" and that leads us to believe that we are indeed living in the season of the Lord's return. Here's the thing, we need to be thoughtful observers of the times. Remember the ancient Jews. The ancient Jews should have recognized that Jesus was the divine Messiah. Back in Isaiah we are told that when the Messiah comes on the scene the blind will see and the deaf will hear and the lame will walk. What happened when Jesus came on the scene? The blind could see, the deaf could hear, and the lame could walk. The Jewish leaders naturally should have been able to see the signs of the times, but they were blind to them. They could tell the weather was going bad by looking at the sky, but they couldn't discern the signs of the times. We should not make the same mistake as the ancient Jewish leaders. There are many signs of the times pointing toward the Second Coming of Christ and the events that lead up to the Rapture. What we want to do is make sure that we're not ignorant of those. We want to understand what the Bible says about the signs that lead up to the Rapture so that we're prepared. That's what my study will be all about. I firstly want to be careful here in saying Jesus is coming soon, because no one knows the day or the hour. Christ Himself told us that. No one knows the day or the hour, but we can know the general season of the Lord's return. I secondly insist that we take a biblical approach. I've seen a lot of very sensational things said concerning the signs of the times where people read things into the Bible things that aren't there. We must take a Biblical approach on all of this topic. I'm reminded of that second grade girl who came home from Sunday school one day. She was so excited about what she had learned. Her daddy asked her, "What did you learn in Sunday school?" The little girl replied, "Oh, Daddy, it was just so great, because you see, God created Adam first. Then God saw that it was not good for Adam to be alone, so God put Adam to sleep and took out his brains and made a woman out of them." And all the women said — Amen! No, that's not in the Bible. That's in Second Allusions 3. No, we must remain biblical. My goal in this lesson briefly will be fourfold. First, I want to talk about the biblical bases for end time apostasy. Second, I want to give you specific examples of apostasy in our day. Third, I want to look at statistics that reveal the severity of the problem. And then finally, I want to close briefly with an exhortation. 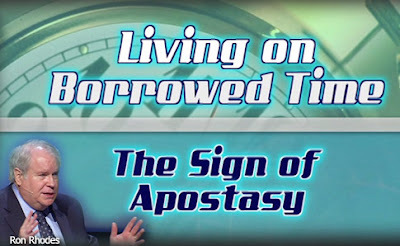 In the second segment of Dr. Ron Rhodes teaching on apostasy as an end times sign, he will explain the character, or lack thereof, of the empty religion of the final days. Is the world living on borrowed time? On November 2, 2013, I was interviewed by Jan Markell, Founder and President of Olive Tree Ministries. 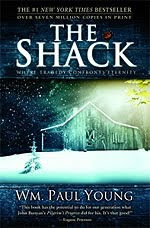 Jan has written eight major books with prominent Christian publishing houses. She has produced a dozen DVDs, some featured on Sky Angel. At one time she traveled full time across America as a speaker. Since 2000, Jan has been broadcasting her nationally syndicated "Understanding the Times" radio program over the airwaves and Internet. It is a great source of news and commentary-driven information. She'll also be one of our guest speakers at the 2014 Lamb & Lion Bible Conference on July 11-12. Jan and I spent the half hour radio program discussing my newest book Living on Borrowed Time: The Imminent Return of Jesus. We consider the signs of the times that are exploding all around us, the mocking of Bible prophecy, the "super sign" of Israel, and much, much more.